One cow in Gilroy on Sunday decided to beat the heat by wading its way through a chest-deep watering hole. When triple-digit heat bears down, humans aren't the only ones who flock to the water to savor some much-needed relief. 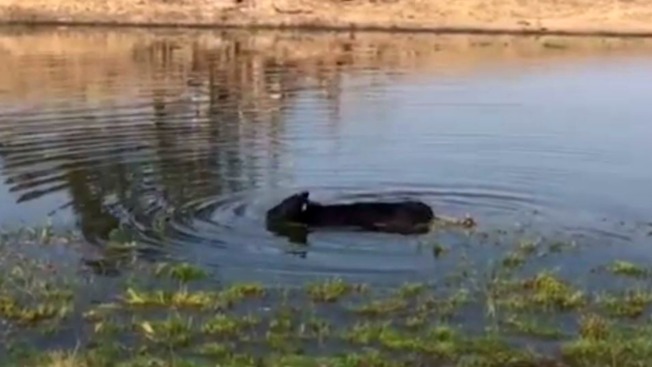 One cow in Gilroy on Sunday decided to wade its way through a chest-deep watering hole much to the amazement of its owner. "I couldn't help but start laughing," Brent Kirk said. "She seemed to be as happy as could be." Kirk, who runs a ranch on the east side of Gilroy, came across the cow around 9:30 a.m. and initially thought his animal was in trouble. "At first I thought she was stuck in the mud," he said. That was hardly the case. As Kirk soon realized, the cow was blissfully splashing around, soaking in a brief break from the sweltering sun. "This girl's got the right idea," Kirk could be heard saying as he recorded the swim. Gilroy topped out at 112 degrees Saturday, according to the National Weather Service, joining several other cities around the Bay Area in crossing over the triple-digit threshold.